1. The job: My association with the internet and e-commerce dates back to the 1990s. It was a time when people were hardly aware about the emerging technology. I could visualize at that time that the internet would bring true convergence in media by combining text, messages, pictures, music, et al. At IndiaMART, we have been working to make doing business easy in India for over 19 years now by helping millions of Small and Medium Enterprises (SMEs) grow their business in the country. Also, with the mobile technology innovation taking place, the whole business seems to be re-written and I am enjoying every bit of it. We have a fairly young workforce and working with these young people who are in their early 20s, definitely keeps you vibrant. 2. The weekdays: My day either begins with a long healthy early morning walk or a long (not so healthy) session in front of the computer, where I manage my e-mails or catch up with the news related to the internet industry, before reaching office. Half my day usually goes in meetings which would have been planned earlier, and the remaining half goes in unplanned meetings, sessions with different teams, etc. I love to spend time on the floor, moving around and interacting with employees, ideating with them, and helping them solve their issues, rather than being stuck in my cabin. 3. The weekend: I always look forward to the weekends. In case I am in town, I usually spend the day relaxing. I wake up late, indulge myself in gardening, try and watch some Bollywood movie during the day. I simply love listening to old Bollywood songs. In the evenings, I prefer dining out and usually love to explore some Alfresco lounge in the city. This keeps me refreshed for the entire upcoming week! 4. The toys: These days I am addicted to my smartphone and my iPad. I have access to all the information at all times through these two, especially my phone. The rapid pace with which technology is making inroads in our lives is extremely enchanting. 5. The logos: I don’t remember being brand conscious at all. 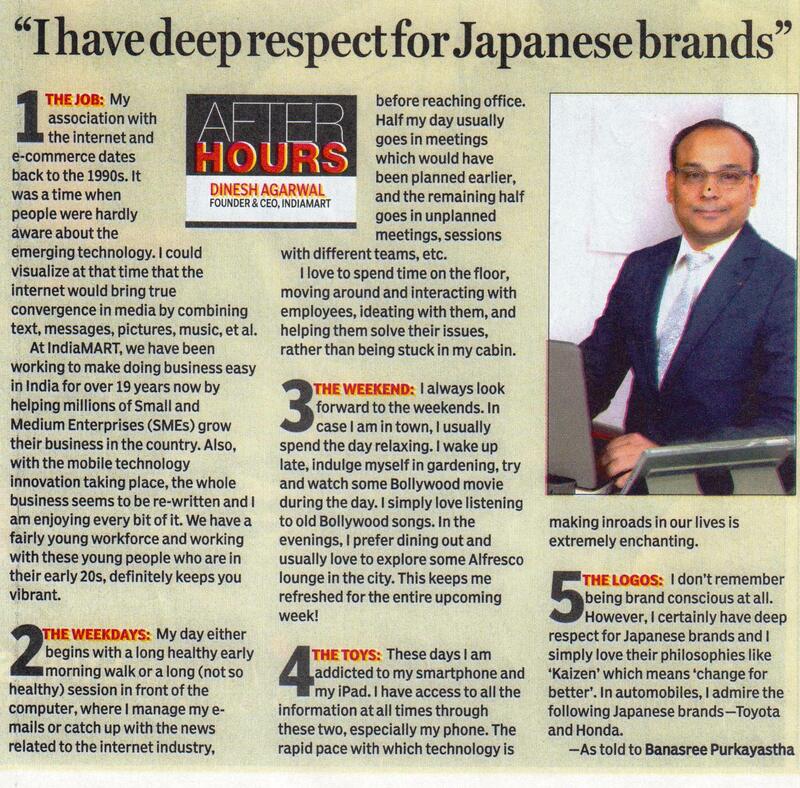 However, I certainly have deep respect for Japanese brands and I simply love their philosophies like ‘Kaizen’ which means ‘change for better’. In automobiles, I admire the following Japanese brands—Toyota and Honda. ← B-Schools hitting the dotcom wave! !